At Outfield our goal is to shed light on the importance of maintaining mental and physical health for the often drained time-limited sales professional. By bringing awareness to this matter we are hoping to drive knowledge motivation as well as action to help improve the well being of sales professionals who might be struggling with mental health matters across the globe. More specifically we would like to convey the positive impact that daily workouts can have on mental health empowering these individuals to be happier and more productive in their personal and professional lives. We believe in this so passionately that we are rolling out the #iamfitforsales challenge which will include informative content and an #IAmFitForSales prize pack. 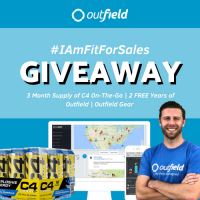 The Grand Prize Pack includes a 3 month supply of C4 On The Go Pre-workout to get your workout started after a long day official Outfield gear to flaunt around your gym and a 2 YEAR license to Outfield’s Field Sales CRM system to make sure you are ALWAYS closing!